‎$932.50 Donated from the Phonewallet Groupon sale of Red and Black phonewallets (373 x $2.50). Seeking an additional $265 from Groupon for the total sales. ‎$270 donated from the recent Groupon daily deal promotion, a total of 143 phonewallets were paid for to Groupon. 108 buyers redeemed their order which raised $270 (108 x $2.50). Usually donate $5 per phonewallet sale but sold at half price so half the usual donation. A redeemed order is an order I receive payment for from Groupon. I will be seeking Groupon to donate $87.50 (35 x $2.50) for the payments they have retained from the purchasers who did not redeem their payment. 35 purchasers paid $24.75 each for a total of $866.25 to Groupon and received nothing for their payment as they did not redeem their order. How good would it have been if they just made a direct donation to the McGrath Foundation? 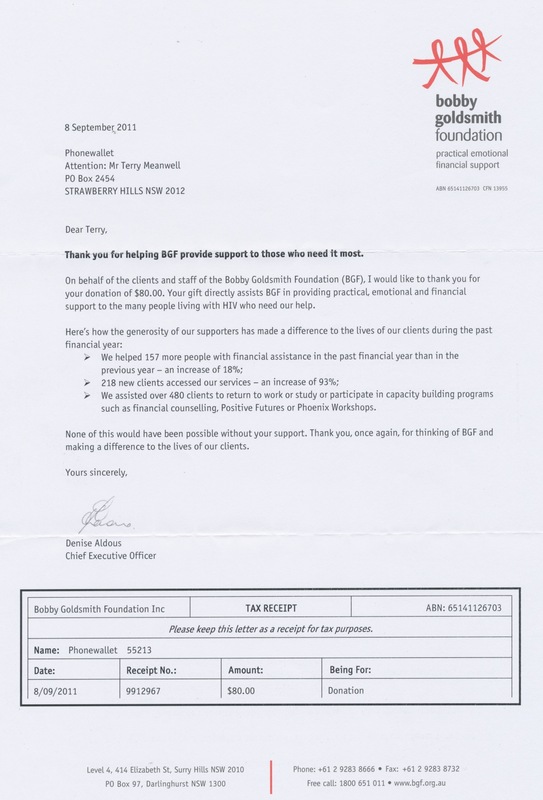 Past sales of red phonewallets and the sales obtained from the ebay store contributing to a donation of $90 to BGF. As only a few buyers have previously taken up the Karma Currency option, recent buyers indicated when contacted re the Karma Currency option that they were happy for the donation to be made to BGF. A $15 donation, since the last donation, for Pink phonewallets. Past sales of red phonewallets and the sales obtained from the ebay store contributing to a donation of $80 to BGF. Karma Currency, lets you choose the charity to be supported by the sale of Black and Caramel phonewallets. Okay I find this new option to be exciting. Instead of me choosing which charity to support for the sale of Black and Caramel phonewallets. You, the individual buyer will receive a Karma Currency voucher code (mid month following the month of your purchase, this allows for any change of mind) which will give you the ability to choose from over 18o charities. See images below of a emailed voucher and the month of July vouchers sent out, also showing 2 redemptions which supported the RSPCA and Amnesty International. Love the quote of Winston Churchill “We make a living by what we get, but we make a life by what we give.” I will like that quote even more when I actually make a profit. Another $5 donation. A bit of good karma on this donation. Within minutes of this donation, another notification was received from Paypal advising of another pink phonewallet sale. See the copy of the emails below, note the times of 12:06:38 for the donation and 12:08:50 for the new order of a pink phonewallet.